Leaders of South Africa's ruling ANC party are meeting to decide the future of President Jacob Zuma, who is under intense pressure to quit. Reports quoting party insiders say the National Executive Committee (NEC) has given him two days to step down. ANC leader Cyril Ramaphosa was seen leaving the Pretoria talks, reportedly for Mr Zuma's nearby residence, before returning to the venue late on Monday. Mr Zuma, 75, has been battling corruption allegations. He has resisted increasing pressure to quit since December, when Mr Ramaphosa replaced him as leader of the ANC. What is Mr Ramaphosa's position? 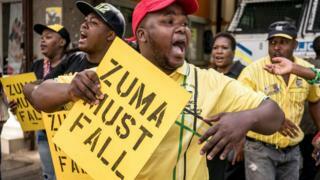 Speaking to supporters in Cape Town on Sunday, Mr Ramaphosa said: "We know you want closure. Our people want this matter to be finalised." He acknowledged the ANC was going through "a period of difficulty, disunity and discord", and said he was seeking "a new beginning". He pledged to tackle the corruption that has marred Mr Zuma's nine years in office. Mr Ramaphosa urged South Africans to restore the values embodied by Nelson Mandela - the country's first black president, also known as Madiba - and said those who had stolen state assets would be brought to justice. "We must work together as Madiba taught us to push back the frontiers of poverty, unemployment and inequality," he said. An NEC meeting was called off last week following direct talks between Mr Zuma and Mr Ramaphosa, who is the deputy president as well as the new leader of the party. What has Mr Zuma done wrong? In recent years his links to the wealthy India-born Gupta family, who are alleged to have influenced the government, have caused his popularity to plummet. Why hasn't the ANC sacked him before? It is worth noting that Mr Zuma has not actually been found guilty of any of the accusations against him. The allegations that there is a corrupt relationship between Mr Zuma and the Gupta family are just that, allegations. And 18 corruption charges, stemming from a 1990s arms deal, were dropped before he became president and have not been reinstated. On top of this, Mr Zuma is still very popular, particularly in rural areas and his home region of KwaZulu-Natal. Mr Ramaphosa may want to make sure Mr Zuma's supporters do not feel he has been treated badly - especially as an election is coming up next year. Correspondents say that if the NEC agreed to recall Mr Zuma, it would be very difficult for him to resist. But he is not legally obliged to step down if they ask him to. If he so wishes, Mr Zuma could carry on as president of South Africa even if the NEC asked him to step down. However, he would then be expected to face a confidence vote in parliament. The date for this has already been set - 22 February. Mr Zuma has survived other such votes, but he would not be expected to pull it off again. A confidence vote would be considered a humiliating process for him and the party. 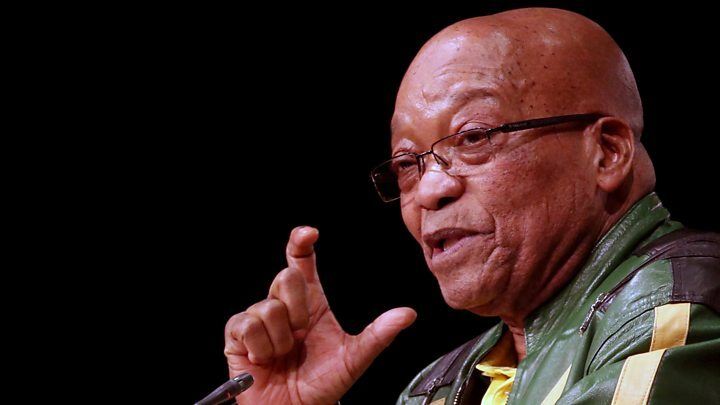 South African media is calling President Zuma's seemingly inevitable exit "Zexit". South Africa's previous president, Thabo Mbeki, resigned in 2008. He also had a power struggle with his deputy. The deputy in question was Jacob Zuma, who took over the presidency the following year.